One of my very first kitchen memories is standing on a stool in my mom’s kitchen, holding the electric mixer that used to be her mom’s and making whipped cream. I remember the feeling of anticipation as I watched the beaters slowly thicken the whipping cream, knowing that my mom would let my sister and I lick the beaters when the whipped cream was done being made. I don’t think that I knew that whipped cream was available in a spray can until I was a teenager, we always made our own! I think there are probably two camps out there– those who always make whipped cream from scratch (and probably think I’m silly for even writing this post because it’s so simple), and those who buy it in the spray bottle and had no idea you could make it at home. If you are in the later camp, today I’m here to convert you over to my team! ;) Making whipped cream from scratch is so easy! You got this! 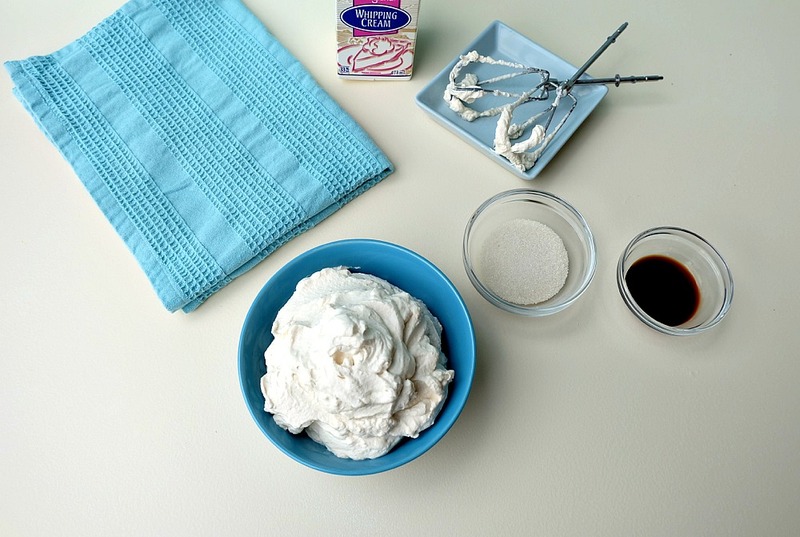 Why make your own whipped cream? –It’s less expensive! I did a price check at my grocery store. Buying a carton of whipping cream was $3.00. Buying a can of whipped cream was $4.00. Looking for an added bonus? The carton of whipping cream made twice as much whipped cream as the can did! –You can control the sugar and other ingredients. When you make your whipped cream from scratch you know exactly what’s in it– cream, sugar and vanilla AND you can control how much sugar you put into it. You could also play with what you use to sweeten your whipped cream with- maple syrup and honey would be two delicious alternative options! –You can play with your flavors. Chocolate whipped cream, coconut whipped cream, peppermint whipped cream… all 100% possible and SO EASY! –It’s better for the environment. I never feel good about tossing out those whipped cream cans. –It’s a fun “tradition” to pass along to your kids. I guarantee, if you start making whipped cream at home and let your kids help make it, they’ll remember it for the rest of their lives. Ready to get started? I made a video sharing just how easy it is to make homemade whipped cream. Read on to watch me in action and for our Back To Basics- How To Make Homemade Whipped Cream Recipe. Step 1: Prep your space and ingredients. My mom always chilled the bowl she was whipping the cream in and her mixers. I always forget this step and my whipped cream comes out fine, but I think her way is more traditional. She stores her beaters inside a bowl in the freezer when they aren’t in use. I also like to lay down a kitchen towel underneath my bowl. When you first start mixing, the whipping cream splashes up a bit and I find having a towel laid underneath makes cleanup easier. Step 2: Pour the whipping cream into a large mixing bowl with high sides. The cream will approximately double in size. Lower your beaters into the bowl and turn your mixer on low speed (make sure your beaters are in the liquid before turning on or you’ll end up with a big mess). As the cream starts to thicken you can increase the speed of your mixer. Step 3: Whip until the cream starts to thicken and you can see ribbons forming in it. At this point add the sugar and the vanilla extract and continue to whip until the whipped cream reaches your desired thickness. I like for it to be able to cling to the beaters without falling off. Serve and enjoy! You can store leftover whipped cream (if there is any) in a sealed container in the fridge for 3-5 days. Want to see me making my whipped cream? Check out this video! 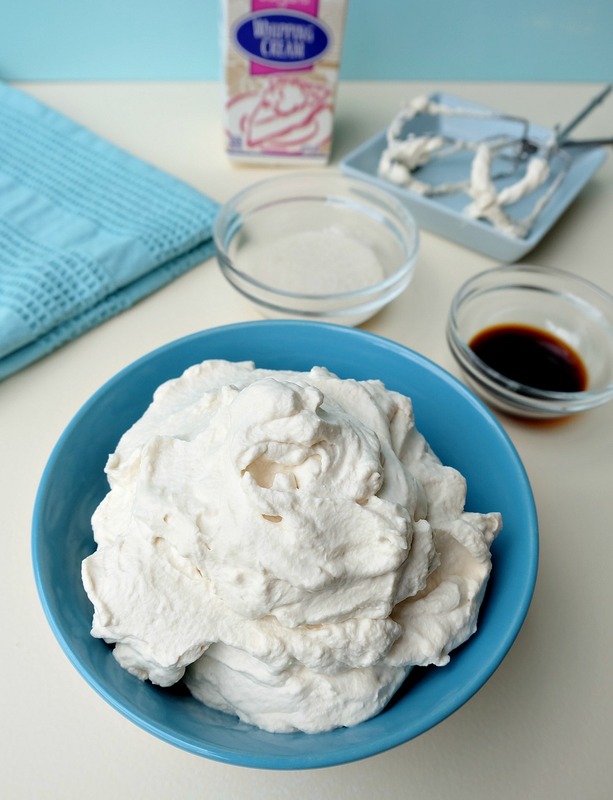 Now you know how to make homemade whipped cream, so why not play around a bit with the flavors! Extracts are a simple way to add flavoring to your whipped cream! Play with the amounts you use to get your desired flavor. Here are a few of my favorites. Play, play, play and have fun. There is a whole wide world of natural flavor extracts out there! I have quite a few of the flavor extracts from Olivenation that I love. Experiment, come up with your own flavor combos and make sure that you come back and tell me your favorites in the comments! 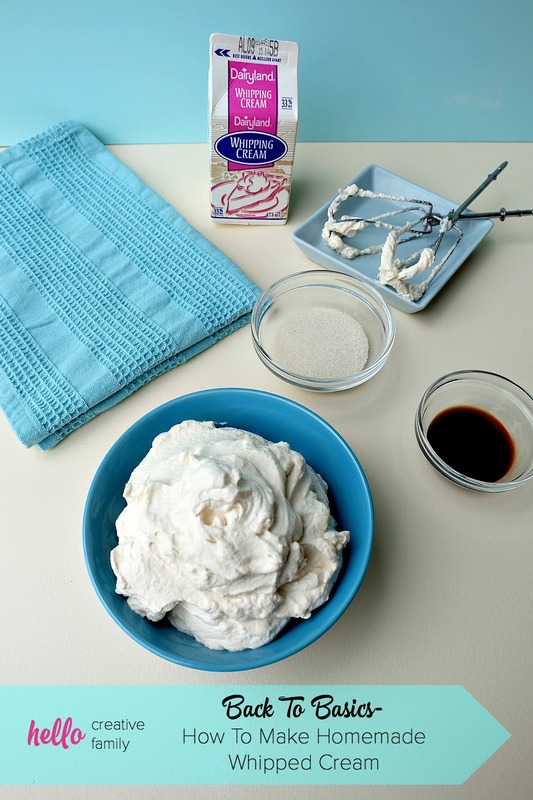 Tell me… Do you usually make whipped cream from scratch or buy it in a can? If the later, do you think you’ll try after seeing this recipe? What flavor of whipped cream would you make? Like this post? 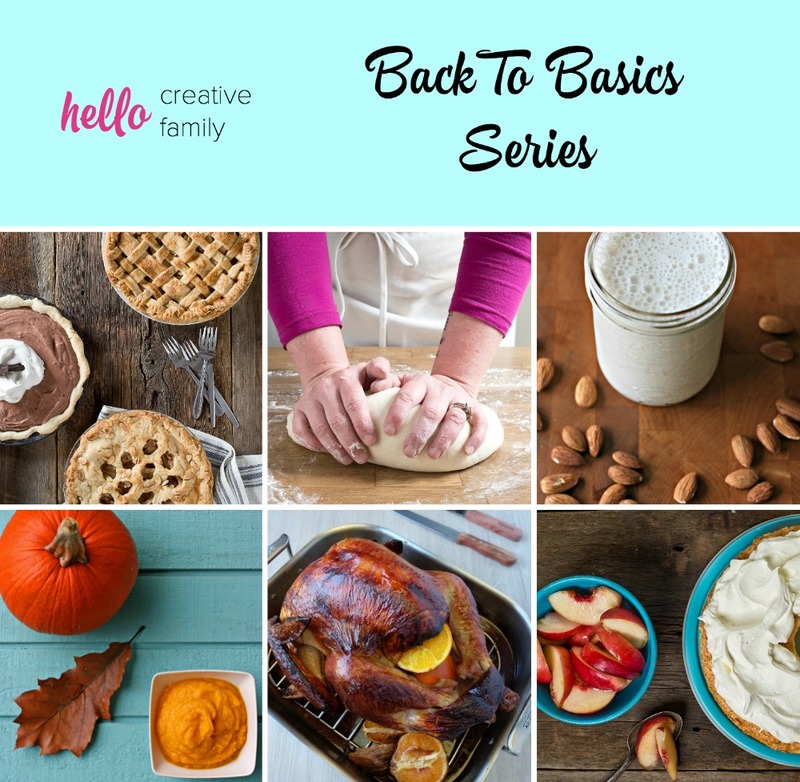 Make sure you check out the other recipes in our Back To Basics series! I hardly ever need whipped cream but I also never tried making it myself. Very useful , Interesting how it’s made and I would love to try this one day. I’ve never tried to make this at home! I’d love to make vanilla whipped cream or hazelnut! I always find it shocking that people buy canned whipping cream the spray kind.. I can’t even put it in my mouth, I grew up never have tasted cool whip – my mother only made real fresh whipped cream. I love adding flavours, but I never thought of peppermint. Great idea. I’m making glorified rice for tonight’s dinner treat. I always use fresh pineapples. I might make a small portion of pina colada whipped cream just to see how it tastes together.